The outside of your home is the initial welcoming area for family and friends. If you have decided that the front of your home, particularly the front steps, needs some added style, you can rely on a fun and simple project. Laying pebbles over the existing cement steps will add a rustic and country element to the home. Purchase all of your supplies, and then set aside some time to get started. 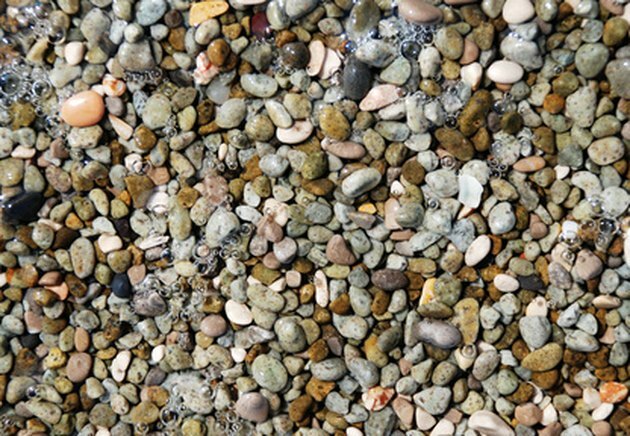 Pebbles can be added to your home's front steps. Put on your dust mask before beginning, and then prepare your pebble paver mix. Combine four parts white sand with one part cement in the wheelbarrow, and then mix with the garden hoe. Add very small amounts of water when necessary to keep the cement damp. The final consistency should be crumbly. Lay the paving mixture over each cement step. Use the trowel to evenly apply a layer about 3/4-inch thick to the top of each step. You can also use the wooden plank to evenly spread the fresh cement. Lay the pebbles on the cement in any pattern you would like. Do not push them into the cement yet. Dust the pebbles very lightly with a soft-bristled brush to help remove any loose dirt and dust before pushing them into the concrete. Carefully place the wood float over one section of pebbles, tap the float up and down with the mallet to force the pebbles into the cement. Continue this along each step until all of the pebbles have been pushed in. Run your hand across the top to make sure they are all at even heights. Prepare the slurry mix. Use a small amount of cement and a larger amount of water. Mix together with the garden hoe in a large bucket. The consistency should be very milky and opaque. Pour the slurry over the pebbles, and allow the slurry to set for about one hour. Turn the hose nozzle onto its finest misting spray, and gently spray the excess slurry off the pebble beds. Stephanie Temperino is a freelance writer in New York City. She specializes in finance and technology topics. Graduating from the University of Massachusetts in 2009, Temperino holds a Bachelor of Arts in finance.